Doesn't have synergy with Secretkeeper as this doesn't count as playing a Secret. Bellringer Sentry doesn't pull this card from your deck. Would you give up consistency in exchange for 'your opponent cant play around it'? Who am I? I don't even know. I guess there will be some more secret paladin action this year. Exciting. With Divine Favor being Hall of Famed, this could be decent to give Secret Paladin a little more value. Not sure if the variance is good for the unpredictability or bad for not playing as good of secrets. Edit: While I'm definitely not an expert on Secret Paladin, my guess by observation is that they want to play secrets that protect their board. With the expansion 4/7 Paladin secrets will do that. 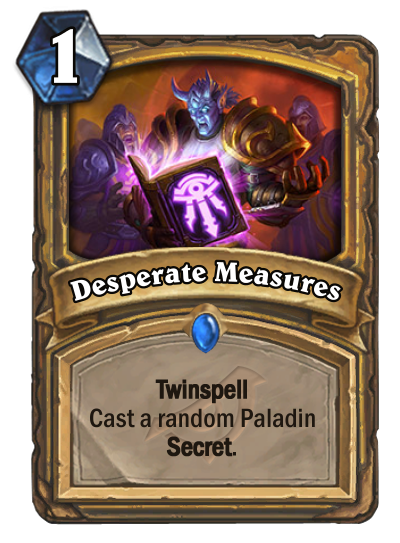 If both spells are cast on the same turn (so the secrets are unique), there's only a 1/7 chance of not getting any of those secrets. So in terms of consistency, I'd say the card is pretty decent. "Prince Liam hasn't reached us yet, without this we'll be overrun." So, here's a technical question with this card. Will it be able to cast a Secret that you already have in play? If it can, then it has a chance to whiff and show you a Secret you have. You can only have 1 copy of a specific Secret in play, but because this is random, can it possibly choose the same Secret? If Yogg-Saron casts a Secret that you already have in play, the effect will whiff (because you can only have 1 copy of a Secret active at a time). Not only that, but it also REVEALS the Secret to your opponent. I imagine this would work the same way. No synergy with secretkeeper, can't be pulled by bellringer sentry or mysterious challenger, can't be drawn by subject 9. Can cast a bad secret. It just doesn't seem right that Rogue and Priest get access to every other class' cards so easily. Oh well, I guess i can pretend they printed another tri-class card. You might be colorblind bud. Interesting way to think about the card. If you ask me like this, I would totally exchange that. card could be good who knows, maybe there is a card yet to be revealed that synergizes with secrets when activated. which in this case would make the card better than it looks. What evidence do we have that this doesn't work with Secretkeeper? It has completely different wording than Bellringer Sentry, Mad Scientist, Mysterious Challenger, and Arcane Keysmith? In the past, Yogg-Saron, Hope's End was explained that it cast the spells, not the player, so that doesn't really apply here either? I don't know of a card that has this wording on it to compare? Knowing Hearthstone wording though, it's just inconsistent keyword use.